Screenplay: Alejandro González Iñárritu, Mark L. Smith. Starring: Leonardo DiCaprio, Tom Hardy, Domhnall Gleeson, Will Poulter, Forrest Goodluck, Joshua Burge, Paul Anderson, Kristoffer Joner, Duane Howard, Melaw Nakehk’o, Arthur Redcloud, Fabrice Adde, Christopher Rosamond, Lukas Haas. Director Alejandro González Iñárritu’s track record speaks for itself in terms of his sombre and unrelenting material. Working alongside screenwriter Guillermo Arriaga, his loose trilogy of films Amores Perros, 21 Grams and Babel all dealt with tragedy and issues of loss and grief and his 2010 film Biutiful confirmed that grim material was his forte. However, his biggest success came last year with Birdman where he was awarded the Oscar for best director. Birdman wasn’t just successful in terms of awards, though, it proved that Iñárritu had the ability to craft something of a lighter nature. But now that he’s got that out the way, he’s back to delivering another punishing drama. 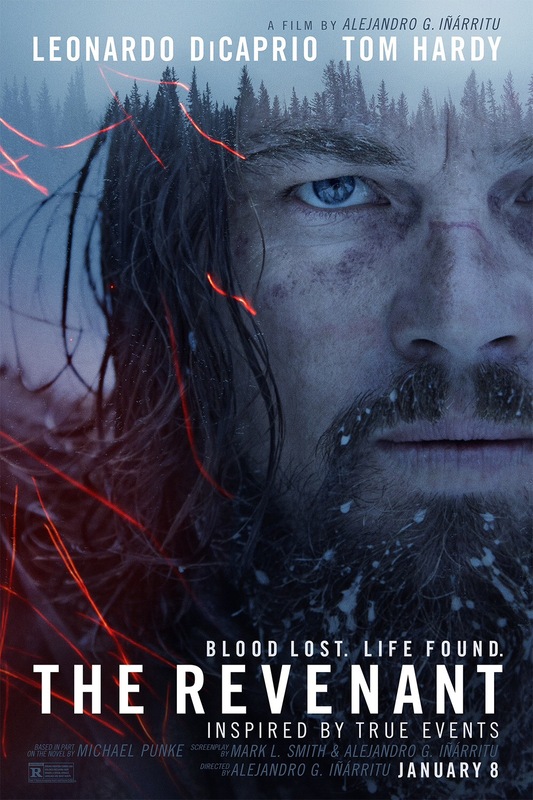 Inspired by the life of frontiersman Hugh Glass (Leonardo DiCaprio) who, while fur trading on an expedition through the American wilderness in the 1820’s, is mauled by a bear and left for dead by his own team. In order to survive, Glass must overcome insurmountable odds in order to take revenge on John Fitzgerald (Tom Hardy) – the man responsible for abandoning him and killing his son. As The Revenant opens I was reminded of a particular filmmaker from the offset. It has a quiet and calming influence in the opening scenes and employs a connection with nature that Terrence Malick is renowned for. This is short lived, however, as what follows it’s calm and meticulous opening is a harrowing battle sequence that’s reminiscent of another director; Steven Spielberg and his chaotic, D-Day landings in Saving Private Ryan. Not since that film has battle been so expertly and brutally depicted onscreen. It’s at this point, early on in the film, that you realise this is going to be a completely immersive experience. Some films often claim the platitude of “an assault to the senses” but Iñárritu’s work here is one of the few that can authentically be claimed as such. We follow our protaganist, Hugh Glass, through a series of life-threatening challenges; his ravenous hunger; the cold chilling him to the bone, or the savage altercations with man (and beast), all the while, experiencing his overriding will to survive. 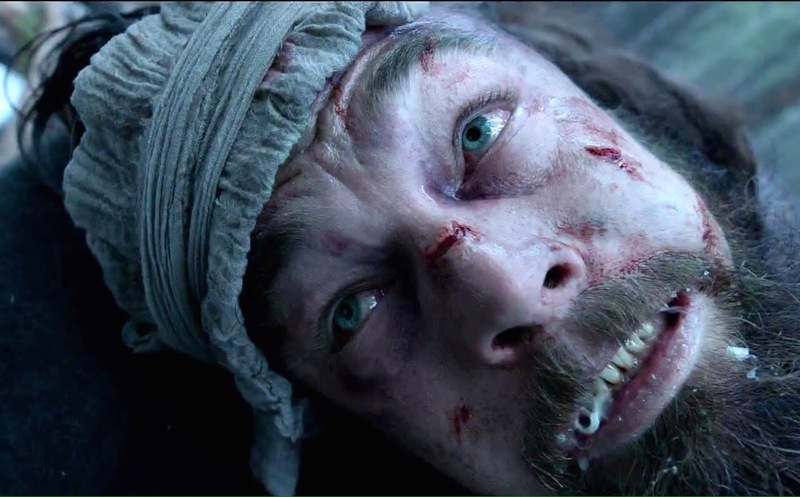 Of course, a lot of this realism comes from how convincing DiCaprio is. Rarely has he been as committed to a role as he is here. It’s an astonishingly physical performance as he doesn’t say a word for long periods of time yet still manages to command your attention throughout some visceral and seriously gruelling ordeals – and his commitment looks highly likely to end his Oscar drought this year. As good as he is, though, Hardy is no less his equal. He brings that dead-eyed stare and ferocity that only Hardy knows how. His John Fitzgerald is a frightening and detestable human being but, under the surface, Hardy hints at something more and manages to turn a fairly straight forward villain into an intriguing, three-dimensional character. He, like DiCaprio, has rightly been recognised with an Oscar nomination and it’s a much deserved recognition of one of the most consistently excellent actors from recent years. What impresses most, however, is not the command of Iñárritu, the two fabulous leads or even the fine supporting work by Domhnall Gleeson and Will Poulter but Emmanuel Lubezki’s sublime camerawork. That’s the biggest draw here. His use of steadicam and long tracking shots amidst the battle scenes are absolutely captivating and his capturing of the sumptuous landscapes are truly breathtaking. The things this man do with a camera are simply unbelievable and with every frame, he crafts an absolute work of art. As if that’s not enough, he does it all with the use of natural light. This type of imagery doesn’t come easy, though. The technical difficulties involved led to a spiralling budget and the film’s shoot going over schedule but when the results look this good, it’s worth it. Since we’re talking awards, Lubezki throughly deserves to make it three Oscars in row after his previously outstanding work on Gravity and Birdman. Many will find it hard argue with the work by everyone involved here but that’s not to say that the film doesn’t have it’s flaws; the passage of time isn’t entirely clear, leaving it to look that Glass healed from his wounds overnight but the biggest issue for some could be how threadbare the story is. There’s really not a lot in regards to plot but I suppose that’s not entirely important when the whole aim of the film is create a sensory experience. When all is said and done, this isn’t a film that’s reliant on it’s narrative. If taken at face value, it’s linear structure could be deemed meaningless. However, if you approach it in a more metaphorical sense then the film works on a whole other level. 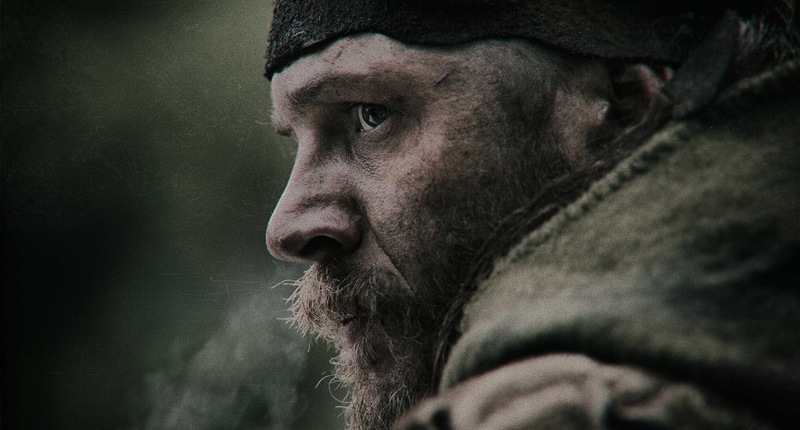 Trivia: Tom Hardy was concerned about the safety of some of the stunts he had to do, which caused friction between him and director Alejandro González Iñárritu before Iñarritu allowed Hardy to choke him in return. Later, the image of Hardy strangling Iñarritu was immortalized in a T-shirt gifted by Hardy to all members of the crew, at the end of the shoot. This entry was posted on January 28, 2016 at 1:22 pm and is filed under Action, Biography, Drama. You can follow any responses to this entry through the RSS 2.0 feed. You can leave a response, or trackback from your own site. I’m a big fan of the cinematography, too. I reckon it’s going to win big at the Oscars. Did you like the ending shot? What do you make of the stare? Is he staring at us, the audience, or staring at his wife? The cinematography was just incredible wasn’t it? I’m a huge admirer of Roger Deakins and waiting for the moment that he finally wins an Oscar but it’s hard to see past Lubezki’s work here. Surely, he’ll make it 3 in row with this. The ending is one I haven’t decided on, Cindy. I suppose it could be interpreted that he could be looking at either of those. One suggesting his own death or the other suggesting the environmental angle again. Our place in this world.? I’d really have to give it another watch. It’s open to debate but to be honest, I’m not even sure I liked that ending shot. It took me out of the experience, you know? It was compelling and thought-provoking which seems to me a strong lasting impression. It definitely left an impression on me, Cindy. It was quite the experience! Totally agree with you here mate. It’s such an impressive film, Lubezki’s work is just phenomenal. The bear fight is just something else. The dream-type sequences didn’t do much for me, but I had very few grumbles with it. Hey Chris. Good to see you stop by, mate. Yeah, it was one hell of an experience, man. I had some grumbles here and there but they were minor when the overall impact was so huge. Nice review Mark. You know my thoughts on Iñárritu, I know that many adore his work but I find his films off-putting and give off a “holier-than-thou” vibe. 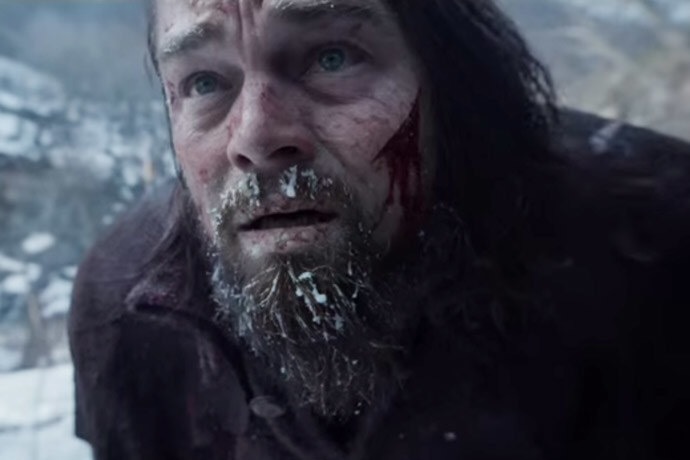 Because of that, I can’t really push myself to see The Revenant, though I know plenty of people have enjoyed it. Thanks Charles. I hear you on Iñárritu. He’s certainly not to everyone taste. I’ve always quite liked his films. They’re not easing viewing by any means but always worth the effort. I know of a few who don’t care for him much either, though. Great review! Really looking forward to seeing this. Thanks man! It’s a gruelling experience for sure but well worth it. You really enjoyed it! As you know I agree with a lot of this, it’s quite an experience. Lubezki’s work is something else. Have you seen Carol yet? Edward Lachman is a more than credible contender, as well as Deakins, and Carol contains my favourite photography of the past year. Anyway, all great work, and I’m glad you mentioned Malick. I forgot to mention him in my review but a lot of the shots of Glass and his wife (visions, flashbacks etc) had that feel. I did really like it, man. I thought Lubezki was the star of the show. Outstanding cinematography! I haven’t seen Carol yet. Really looking forward to that and I don’t doubt the cinematography is great. It’s looks beautiful. I’ve seen Sicario and Deakins does some wonderful work there. He’s actually a real favourite of mine but I struggle to see past Lubezki. Good review. It’s unrelenting, bleak and grim. However, I hardly ever looked away. Cheers Dan! I couldn’t agree more. It’s definitely not the happiest of journeys but still worth taking, nonetheless. Fantastic review Mark! This one was just so immersive, it felt different. And I loved the acting, directing and most of all the cinematography. Thanks man! It just draws you in. The story was mainly the thing that I found fault in but other than that, everyone was on top of their game here. Yup, I liked the story too! I thought it was really true-to-life. Really glad you went for this one Mark. I loved it. So much going on under its surface. It was very good, man. It’s what was under the hood that I found most interesting. On the surface, it was a generic revenge plot but I reckon there’s more to it than that. Di Caprio was also great but I was a huge admirer of Hardy. Without taking anything away from Leo, I thought he delivered stronger work. My hope is now with Hardy for the Oscar. Hardy was superb. I’m telling you, this movie really stuck with me. I went back and saw it a second time and noticed even more layers than before. When I reviewed it I gave it the same score and I think it is well deserved. It’s hard to give it anything else than 4.5. You have a review done? I’m missing all sorts of posts these days. I’ll swing by. Very much interested in your take on it. I would love to watch this movie again. Haha! You’d have to colour them all in with a different colour. My 5stars always appear in red. Ah yes, of course they are! Doy. There are very few cons, for sure. I felt I had to mention a couple to justify why I never gave it the 5stars. I think you’re right, though. Come Oscar night I think this will soar. It’s hard to see anything on the same level. DiCaprio is shoe-in for best actor but if Hardy doesn’t get best support then I’ll be seriously pissed off. I thought he was outstanding. Leo is getting all the plaudits but I actually thought Hardy was stronger. Great review Mark! This movie was simply stunning to look at, and DiCaprio and Hardy really brought the goods with this one. Cheers Zoe. It’s a stunning film on so many levels. And Hardy and DiCaprio were excellent. I’m rooting for them both at the Oscars this year. I will be rooting for both, as well, but I will riot is DiCaprio gets snubbed AGAIN. Haha! I can’t see anyone strong enough to take it from him. Although I haven’t seen Redmayne in The Danish Girl yet. I think Stallone will take supporting actor for nostalgia reasons but I think Hardy deserves it. Excellent review! I am seeing it this week and I just cannot wait, so glad to read the praise for Tom! Thanks Sati. It really packs a punch and as much as all the buzz has been surrounding DiCaprio’s work, I actually thought Hardy was even better. I don’t think he’s been getting enough credit. Hope you enjoy it. Terrific stuff Mark. I find myself agreeing with you almost exclusively. 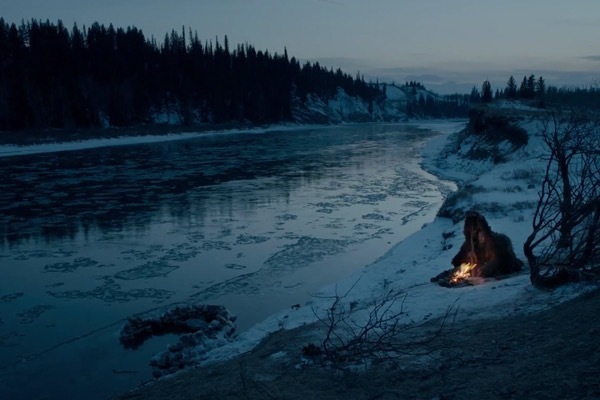 I had a discussion the other day about The Revenant with someone who didn’t like it as much as we did, and I can see why given the film is narratively light (and perhaps cold — I don’t even think Glass is a particularly interesting character). But the performances of DiCpario and Hardy, the sheer technical prowess, the cinematic experience — all of that superseded the lack of narrative richness in my eyes. Great stuff Mark. I’m all alone on my island! I loved the look of this but not much else. =/ I’m glad you liked it though, as so many have. I will say though that I gotta agree with the lack of knowing how much time passed…. one moment his leg is twisted around and totally fucked, and not long later he can suddenly walk perfectly, even nimbly dodging when needed. That took me out of the experience over and over. Fair enough, man! To each their own. I can see why this might not work for some. Totally agree on the passage of time, though. That really did irk me quite a bit and I’m still pondering that ending myself. I’m actually not sure if I liked it or not. I’ll wait for another viewing before deciding. That said, there’s were so many other things going on that I couldn’t help but be immersed for the majority of it. I must have missed what he says in Pawnee. I don’t recall that but now I really need to catch it again. Sterling work Mark, this one sounds like a contender for one of the top movies from 2015. It’s good to see Hardy getting a lot of praise. Cheers Vinnie. Like I mention, there are flaws but it’s still a stunning piece of work and Hardy was a real highlight for me. As good as DiCaprio is, Hardy shades the performance stakes for me. Hardy is such an amazing actor, it’s great to hear him getting loads of praise. Top notch performer and has been for years. It’s great to see him finally get some awards recognition. I only hope he can win it. I don’t think I’ve ever seen him do a bad performance. Yowzers, great review Mark! Watching this sometime this week hopefully, but boy has this film been divisive! One of those films you just have to see at the cinema. The acting is phenomenal though Leo should have won for past roles. I thought of Saving Private Ryan too. The cinematography is just superb. it just makes you want to be a photographer doesn’t it. And I saw the ending as him looking at the end of life. It’s was quite the experience, man. I had Leo a hands down winner for the Oscar for his work here but now I’ve seen The Fass in Steve Jobs, my opinion has changed. 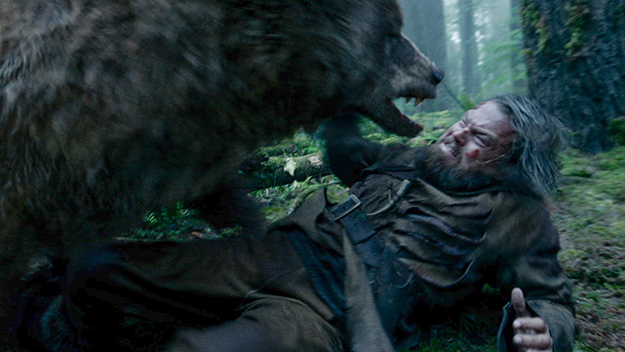 That said, I still think The Revenant will clear up.